Enjoying an advantageous location on the Calangute Beach, Alor Beach Resort, Goa is an easily accessible Goa accommodation which is designed to meet your travel needs in a satisfying way. 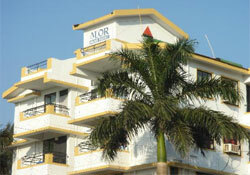 The flawless and efficient service of the staff at Alor Beach Resort, Goa are sure to win hearts. Alor Beach Resort, Goa offers its guests 70 tastefully appointed and generously spaced studio rooms along with one bedroom apartmentsespecially meant for couples and families. The comfort quotient of the rooms in enhanced by the availability of a host of in-room amenities that include attached bath, bathtub, shower, running hot and cold water, television, telephone, refrigerator and complimentary newspaper. At Alor Beach Resort, Goa, the guests can savor delectable meals at the multi cuisine Paguer Restaurant and Bar. The culinary preparations are scrumptious and are sure to leave a rich aftertaste. Alor Beach Resort, Goa even impresses the business travelers with its well-equipped conference hall that is capable of taking care of all you corporate or business requirements. At Alor Beach Resort, Goa you can achieve a subtle balance between a healthy body and a healthy soul. The resort makes available a number of health and recreational facilities to its guests that include Reiki and masseur, a well-equipped gymnasium, game room, tennis, swimming pool, evening entertainment and dolphin trips. The other additional hotel facilities comprise of baby care, car parking, children welcome, money changer, safe deposit, room service, travel desk, doctor on call, laundry facilities, power back-up and laundry facilities. "Rome of the East", "Pearl of the Orient" and "Tourist Paradise", all these are the popular epithets that Goa is known by. Touted as one of the best beach destinations, Goa is all set to win hearts by its long stretches of white, sandy beaches and other diverse tourist highlights that include quaint buildings, temples, churches and forts.